We’ve just added the last finishing touches to a new Blue Forest family treehouse and we have to admit this is one of our favourites. We’ve been building treehouses across the UK for a long time now, but we still enjoy that moment when we can hand over the key to a client and see their faces as they take a walk around their very own outdoor hideaway for the first time. An enchanting retreat designed for the whole family, The Magic Home overlooks the beautifully tended gardens and tennis court from its elevated position on the edge of the grounds. With two young children, our client wanted to create a special space within their garden for their family to enjoy together. Our brief was to design a truly enchanting family treehouse with a range of surprising and imaginative features. Close to surrounding woodlands and sporting an attractive turret roof line, the building boasts a stainless steel tube slide and a zip wire that will keep the children entertained for hours. 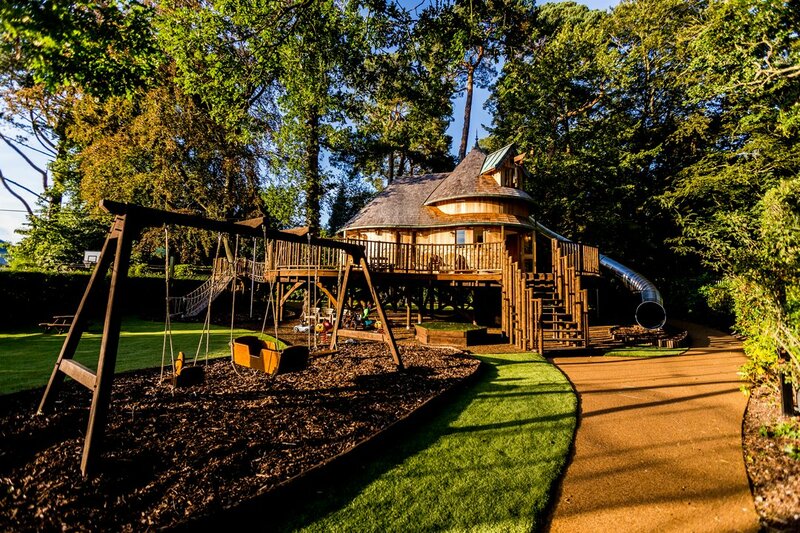 Aside from the traditional play features such as rope bridges and swings, The Magic Home also offers the children of the family a very unique play area of their own. Designed around a philosophy that values the magic of young imaginations, elements that keep the children engaged are included throughout. A curved bookcase appears to simply display picture books and toys, but is in reality a revolving door that reveals a secret spiral staircase. Giant books have been stacked to one side to create a creative writing desk, and a moon light hangs down from the ceiling. You might think that a small wardrobe is an odd thing to find in a children’s secret playroom but just like the wardrobe in Narnia, if you open the doors you’ll discover the entrance to the tube slide which curves all the way round the treehouse to the sandpit outside.